As whispery, disembodied voices engulf you in a thick, almost palpable miasma, the somnambulist-like protagonists - the members of a dysfunctional family or out-of-time manifestations of an aging couple - thread their ways through moldering memories, unquenched desires and unresolved feuds reflected in the absolutely mesmerizing chiaroscuro compositions worthy of comparison to the works of Baroque masters. On top of that, Oleksandr Shchetynsky and Yuriy Yaremchuk provide a dissonant, haunting, disturbingly sensual score in which cello and piano act like lovers whose passion often borders violence, deepening the disorienting effect of inspired, yet tricky visuals. Soft focuses, elongated shadows, disquieting close-ups, distorted camera angles, and the brilliant use of mirrors create the atmosphere of inescapable claustrophobia and stark hopelessness, with only a few brief moments of (exterior) relief during the prologue and epilogue. Certainly an acquired taste, Las Meninas is one of those films that will either frustrate you or plunge you into a state of ecstatic trance. 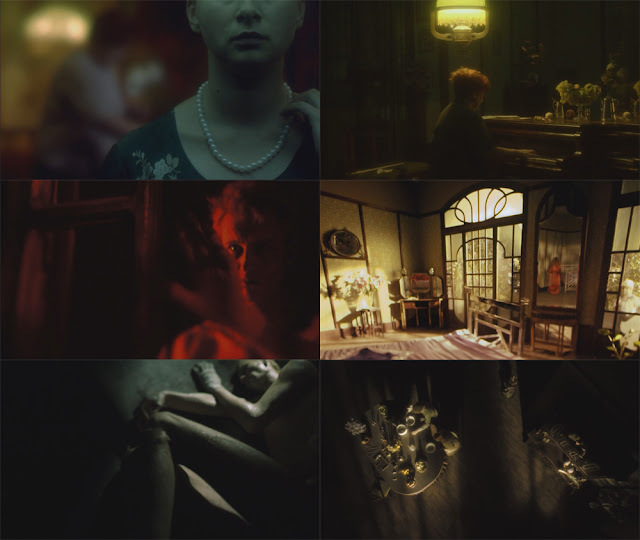 It makes a great companion piece to Raul Ruiz's surreal fantasy-drama On Top of the Whale, Aleksandr Sokurov's period piece Mournful Unconcern, Oliver Smolders's brooding mystery Nuit noire or Daniel Fawcett and Clara Pais's alchemical phantasmagoria The Kingdom of Shadows. The film can be viewed for free on Ihor Podolchak's official YouTube channel.